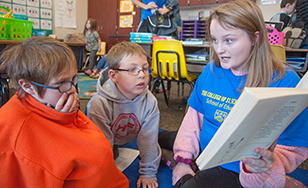 Denfeld High students are working with children at Laura MacArthur Elementary. If you stroll through a Duluth high school, it's easy to notice the student body's diversity. Individuals of different genders, ages, ethnicities, sexual orientations and social statuses form a learning community. Then, look a little closer at the educators. There, diversity isn't as strong. "We're missing voices of underrepresented people, and we want to hear their voices," said Beth LaVigne, assistant professor in the School of Education. That's why the College has joined forces with Duluth Public Schools to launch a new program called "Pathways-2-Teaching: Introduction to Socially Just Education." "This is a deliberate mechanism to promote education careers, and a way to potentially increase diversity within our local teaching ranks," said Sumair Sheikh, the career and college readiness specialist at Duluth Public Schools. About three years ago, a group of local students of color were asked if they'd ever had a non-white teacher here in the Twin Ports. Not one student had that experience. "That really kind of hit me," said Sheikh. He and LaVigne began to consider the root cause of the lacking diversity in our educators. "Were diverse teachers not being recruited?" they wondered. "Were they not put on the path to education?" Together, St. Scholastica, Duluth Public Schools, Duluth Federation of Teachers and community members worked to develop their own program within the national "Pathways2Teaching" directive, aimed at helping marginalized young people explore teaching as a potential career choice while examining critical issues related to educational justice. "Exposing students to scholars of color is important and helpful in acknowledging the scholarly contributions of diverse people," said Doreene Etongue-Mayer, chair of St. Scholastica's Undergraduate Education programs. "As aspiring teachers, they need to understand the social justice nature of teaching and the teacher's role in dismantling racism through including voices that have been historically left out." "Lacking diversity is only one part of the problem. Teacher shortages are getting worse and worse. We need to build the next generation of educators," said Bradley Vieths, who graduated from St. Scholastica in 2001 with secondary social sciences and elementary teaching licenses. Today, Vieths is the vocational programs coordinator at Duluth Public Schools and is involved with Pathways-2-Teaching. "The concept here is introducing kids to not only education careers, but what it means to be a teacher, and your role in society." The Minnesota Education Equity Partnership cites that, in Minnesota, roughly 32 percent of students are of color or American Indian. Only 4 percent of teachers, on the other hand, are people of color. The organization states that a diverse teaching workforce is key for producing strong, racially equitable education outcomes. Currently in its first semester, 40 students are involved in the year-long program. The three-credit class is offered at Denfeld High School and Duluth East High School, and there, students explore critical race theory, study the history of our education system on state, local and federal levels, tutor elementary students, visit St. Scholastica and more. Students have the potential to earn college credit, and there are no barriers to participating, such as requiring that the student must have a high grade point average or no disciplinary record. The College modified its traditional requirements to give all students the opportunity to join the class. LaVigne said it made sense, as the program is a representation of the College's Benedictine values of respect, hospitality and community. "It's so students who grow up here, who maybe didn't see teachers who look like them, want to stay here and be a teacher and provide quality education for our kids," said LaVigne.